Heart Shaped Sweat: Scared of the gym? Top 10 reasons not to be. Each one of us at some time or another has held a fear large or small towards the gym. Hopefully, that fear has diminished and not prevented you success in the gym. If not....my hope is to help you overcome them, now. 10 reasons to NOT be scared of the gym. I am scared everyone will watch me. This is probably the most common of all fears. People Watchers. They are not at the Gym. They are at Walmart or the mall. If you find one at the gym, they do not matter. We are all very busy people. Members of your gym, like yourself, have tight schedules and most likely, a limited time to spend at the gym. Their priority is fitness, not you. Yes, you may notice someone glance at you but if you really spend time facing this fear....you will see that no one has the time to really watch you. I can't do a single push-up, pull-up, or sit up. That's ok! No one has ever started at the top! Find the piece of equipment that trains your muscles for pull-ups. It exists! This piece of equipment has a bench for you to kneel on and is spring loaded, so that, when you reach above head for the bars, you glide up and down...eventually removing the kneeling pad. Learn the proper modification for the exercise you want to do. Again, consult with an instructor for direction. Take a level 1 class. Sign up for water aerobics. I do not know how to use the equipment. Where do I start? Think of the gym as a small community. Get familiar with the equipment available to you and make a mental map. Straight forward to the elliptical then a left to the free weights and then a quick right to the floor mat for crunches. Start with 30 minutes, 3 times a week. Progress to 1 hour, 3 times a week, etc. Remember, a good gym is able to cater to needs of all fitness levels. You do not need to fear the gym equipment. Most times the equipment has pictures, suggestions for exercises and muscles groups targeted. If not, ask an instructor to demonstrate, they are paid to help you and are happy to do so. Your gym should have resources readily available to you. Use them and understand how to control the equipment so that it doesn't control you. I don't have clothes for the Gym. This excuse fear just needs to die out. It's horrible. Let's look back at #1 reason to not fear the gym. People do not go to the gym for outfit inspiration. And, in case you are wondering...any old pair of cotton shorts and any old t-shirt, holey or not, is perfect gym attire. You do not need to wear the latest Nike trend or even be color coordinated. Just remember deodorant. I don't like the way I look. People will see my flab. Give yourself one month. Just one month and this feeling will go away. I promise. This shouldn't be a fear. People of all shapes and sizes have a gym membership and use it. Who's to say which size is right? Really, it's society's fault that women and men have some image of perfectionism. Screw that image. Get yourself into the gym, give yourself one month and you'll find a new level of confidence. Try going at times other than peak hours until you are more comfortable. Overtime, you may have lost a few pounds or the number on the scale may be the same as day one. But what you gain from your time in the gym is what you need to focus on. We all go to the gym for the same reason, improvement. While this is a completely legitimate fear it is, also one, that can be easily dealt with. If need be, speak with your doctor before starting any routine, getting clearance and special instructions for your gym plan. Check your gyms website for classes geared towards any special needs that you may have. Most gyms offer classes at different levels for this very reason. Read the details regarding each class available until you find the one best suited for you. A good gym will have instructors trained to catch weak form that could result in injury. After taking a few classes you will find yourself more comfortable and knowledgeable of your skill level. Learn a few, good stretches. Stretching will help prevent soreness and that awkward stiff walk. I sweat like a pig. Breathe heavily. And look like death after a workout. I am this person every time I hit the gym! The quote, 'if you look cute after a workout, you didn't do it right'...explains it best. I prefer to think, I'm glistening after a workout. And, any chic finishing a sweaty set is pretty damn hot. Every one of us sweats while we workout. We want that to happen. Our core temperature raises during a good workout and sweating is one of the body's ways to regulate this. You want to sweat. Breathing heavily is ok too. You should aim for a comfortable rhythm. Listen to music, it will drown out the sound of your breathing and give you a tempo. You do not want to be gasping or hacking. That is not healthy and no, no one would appreciate the latter of the two. I don't know which Gym to join. This is a big fear for many and understandably so. With so many options...how do you chose? Begin with walking in. Simple as that. Visit your area gyms, ask for a trial membership. Most gyms offer a few days free to help you with your decision. During this time you should look for a wide range of equipment, class availability, an indoor track if you prefer that over a treadmill, a swimming pool, a sauna, daycare options, after school care....any of these options that may influence your decision. Make a list of your needs and what you want most from your gym membership. After each tour take a few minutes to cross compare with your list and make a note of the open and closing times of each gym. Obviously, money is a factor but if possible, not a deciding factor. If you are, at all, serious about this membership you will find yourself spending a lot of time here and the quality of the gym and its resources will far outweigh a few dollars of savings per month. The gym is boring. I'll get bored and quit. If this is one of your fears you may want to look at back at "which gym to join"
Your gym should have a variety of options available to you, preventing boredom. Set up a schedule for the week, create a colorful calendar, to keep you rotating through different pieces of equipment or classes. Focus on upper body one day and lower body another day. Taking a spin class on Tuesdays and Pilates or Yoga class on Thursdays. Classes are a great way to expose yourself to exercises and routines you may not have known about and also gives you a chance to meet other people. Gym buddies will save you from boredom! The gym can be a very dirty place. A good gym will supply sanitizing spray bottles, use these, unfortunately you can't trust that other members have cleaned the equipment after use. Bring a towel with you. A good workout may include some floor time, you'll feel better about laying your head on your own towel. Wash your hands before and after your time spent in the gym and of course cover any cuts and scrapes with appropriate dressings or clothes. If you still have fear towards the gym and aren't quite ready to start, dedicate time to working out at home or in your neighborhood. You can, certainly, grab a DVD and some pieces for a home gym. Eventually you'll find your stride and head right into the gym. 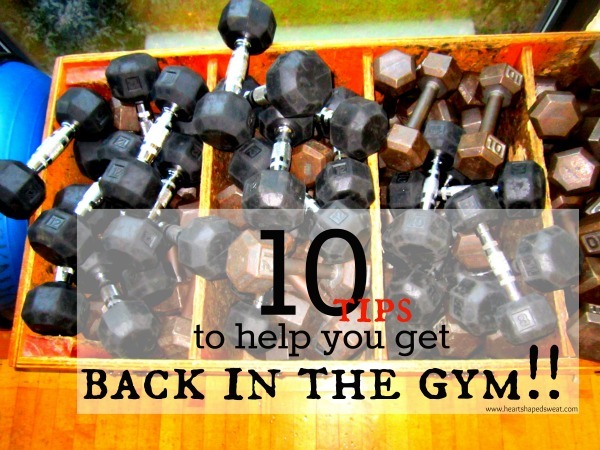 Once you go a few times, you'll have a new confidence towards the gym. No one was born with the perfect body and really, it doesn't exist. And as they say, no one walks in the gym a master of its equipment. Get yourself a good pair of gym shoes and be comfortable in your sweaty skin. This is a great post!!!! I sometimes feel this way. awesome. Thanks for linking up! Hey there visiting you from "Tell me about it Tuesday". Our apartment complex has a small gym which I truly appreciate. I am not a class person so they do not appeal to me. Having the basics right here is a godsend though. I am an outdoor exerciser and have tried a full on gym in the past but it really just didn't do it for me. I enjoy running outside then using a few weight machines in the apartment gym. You look awesome by the way. Oh girl you had no idea how much I needed this! So happy I found you - you're awesome! Hey there! I'm checking you out via "Tell me About it Tuesday" over on Helene's blog. Very happy to find a great blog talking about fitness. Can't wait to read more...I'm your newest follower! I was scared to go to the gym for my first two years of college. I lived on campus and went to a huge school and there were always lines and girls who were super in shape. I know they're excuses! But I moved off campus junior year and signed up for a private gym and LOVED IT. Went every day. You really just have to find what works for you! Great post! Great post! I think we all have felt some (or all) of these at some point! I used to hate the gym but then I found regular exercise classes to go to and made some great friends! Linked up from Motivate Me Monday! Thank you for these tips. I am trying to build up my motivation to get back to the gym. I really need to! I'm a new follower. And also a military wife. So happy to find your blog. I just saw this post from your favorites of 2012 and I love it! I am SO GROSS after I leave the gym haha. I don't care. I feel like it means I accomplished something. On days that I have a bad workout I definitely leave looking a heck of a lot better than the days that I have a good workout...and believe me, I wish I was leaving looking disgusting. The selected moves are classics, selected for their ability to efficiently target major legal steroids muscle groups. They are simple to follow and execute, which allows the class to move at a steady pace. From to the history of body building and body fitness; gyms are the best option for building your body shape or fitness, but in know a days no one want to spend their time for doing exercise on gym or using the heavy exercise equipment for build their body fit and smart, and some people are scared for using this type of body building machine of gyms. For these types of people who don not want to waste their time on this or also want a quick result of weight loss or fit body, please use the fat diminisher system this system has the quality to build your body like a bodybuilder or loss your extra fat in a manner way. The post about gym is great,I go 3 times on week at gym: healthy mind in a healthy body. Gym is very important for our health, your article is cool.